I really don't think this is a hard process at all. I hope it will encourage both old and new users to the GIMP. It also shows a lot of tool usage for newbies, so don't fear! 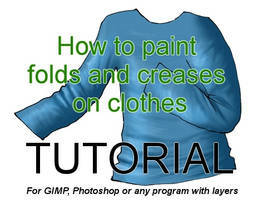 Hopefully you will pick up some invaluable but simple GIMP handling. Dare I give credits?? 100% GIMP 2.4. Haha really, depending on your patience and the program you use, it should take about 2-4 hours if you want a long hairstyle as a whole to be nice, clean, and complete. A short hairstyle need only take an hour or so. Happy arting! Great tutorial!! THe best ive used out of alot! How do you get the paths to connect without stroking it then going over it again? Really? Aw! It looks so messy now that I look back it. But I guess that's kinda how I roll. I actually just select from path and fill the exact shape without a stroke on it. Select from path shortcut = "shift + V"
But I don't think I really understand your question, what do you mean by "going over it again"? I think I understand what you mean, but I've never had that problem... when making a path, I always just press "b" to start the path tool, and then just click where I need the points. OR I put the points down and, each time I click to make a new point, I keep the button held down and pull so that the line will bend at least close to what I'd like. They don't always cooperate, so I have to go back and tighten them up, but otherwise it works fine. If I select from path it should all close as a full shape and be filled with whatever color I drag into the selection. Oh my gosh thank you souch that's exactly what I needed! Sorry aboutbmy horrible descriptive skills. Ahaha don't worry about it. I think in the tutorial there is a little image of path tools and how to twist them. Basically you can either click on the line and tug it, or tug the actual strings that control the line to be a little more specific. Again thank you very much, your tutorial is very helpful! OMFG i pray to u this is so damn useful thank u thank u thank u!!! A tutorial for Gimp 2.4?! Awesome tutorial. I'll use it when I'm coloring my stuffs! I'm so glad!!! I really hope it does help! Feel free to ask any more questions you may have! aaaah...i totally feel like i've been ignoring you....im so sorry! ;______; thanks for your patience with me TTwTT i really will try! OH, awesome! I've been using GIMP for only a month or two and it's the first digital program I've ever caught on to, so this is really great for me. Thanks so much! Fantastic!! I'm very gratified to think that I can be a help to you! Ooh, I didn't know about the transparency lock. That is useful knowledge indeed. D: I knew it had to exist somewhere! !